Grab this divine dining experience for two for just $99. Alternatively choose to pick an option for four people for $198, six people for $297 or eight people for $396. With Muse on Allen Restaurant and Bar you and a friend will enjoy a rhubarb and peach kir royal cocktail on arrival and a five-course degustation dinner. 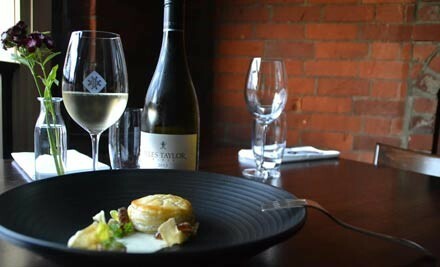 See why this skilled chef won the Mindfood Wellington on a Plate Competition 2013. Take note of the elegant patterns, textures and flavours created by these extremely talented chefs. Enjoy your meal from 5.30pm, Tuesday - Friday with this dining experience. Let your evening unwind in the beautifully intimate surrounds of this leading restaurant. BOOKINGS ESSENTIAL. Subject to availability. No walk ins. Valid Tuesday to Friday Only. Not valid the 13th or 14th of February. 48 hours booking in advance, 24 hours cancelations. Non-alcoholic substitutes available. Must be used in 1 visit by number of people specified on coupon. No cashback. No refunds unless required by law. Not to be used with any other offer. R18 for alcohol. Always drink responsibly. If alcohol is purchased, food must be consumed. Host responsibility applies. Liquor license number: 049/on/197/2013. Muse on Allen Restaurant and Bar has had its fair share of time in the limelight and for good reason. Talented head chef, Samuel North, has a passion for creating intricate meals that will introduce the palate to an array of unique food combinations. Sam and his team offer contemporary New Zealand/European cuisine created through a series of new and modern cooking techniques. Using the most organic, fresh and local products possible you will experience an injection of exciting flavours that are widely talked about through the Wellington region and beyond. From the layout of the restaurant, the quality staff and the food itself, everything serves its purpose in delivering an exceptional evening of fine dining. Take this fantastic opportunity to try a this five-course degustation dinner to understand what all the talk is about. Owner and chef, Samuel North, won this year’s MiNDFOOD Wellington On a Plate Award, which recognises the top level of creativity and skill among Wellington’s chefs, along with their ability to showcase local ingredients through Dine Wellington’s festival programme. Please check fine print for any restrictions.